Mullan attended the inauguration of President Nelson Mandela as the guest of Archbishop Desmond Tutu along with AFrI colleague, Joe Murray. 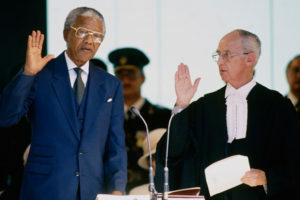 Later they attended a symposium on Robben Island to discuss the future use of the former prison that incarcerated many of South Africa’s black leaders, including Nelson Mandela. Archbishop Tutu invited Mullan to address the gathering on the Great Famine Project, as a demonstration of remembering the past in an empowering way. After 14 years, Don Mullan concluded it was time to leave AFrI. He left AFrI in the knowledge that the organisation was financially stable and he was leaving it with a positive legacy of ideas to build upon. Indeed, almost a quarter of a century after his departure, the Great Famine Project, the Doolough Famine Walk, the Choctaw/Ireland connection and St. Brigid’s Peace Cross Campaign remain solid bedrocks of AFrI’s annual activities.